The LEGO Creator set that was the basis of my MOC. My LEGO fans are starting to wonder what I’ve been up to? Have I entered those “Dark Ages” where the unfinished sets and random pieces lie scattered across the floor, gathering dust while my attention turns to video games? Fear not, for Little Brick Township remains “the place where dreams are built”! In fact, I recently finished a new deli, except for a few interior touches like an espresso maker for the deli and furniture for the upstairs duplex apartment. The deli has found a home next door to City Hall, even though the master plan had City Hall in its own central space surrounded by streets and parks. 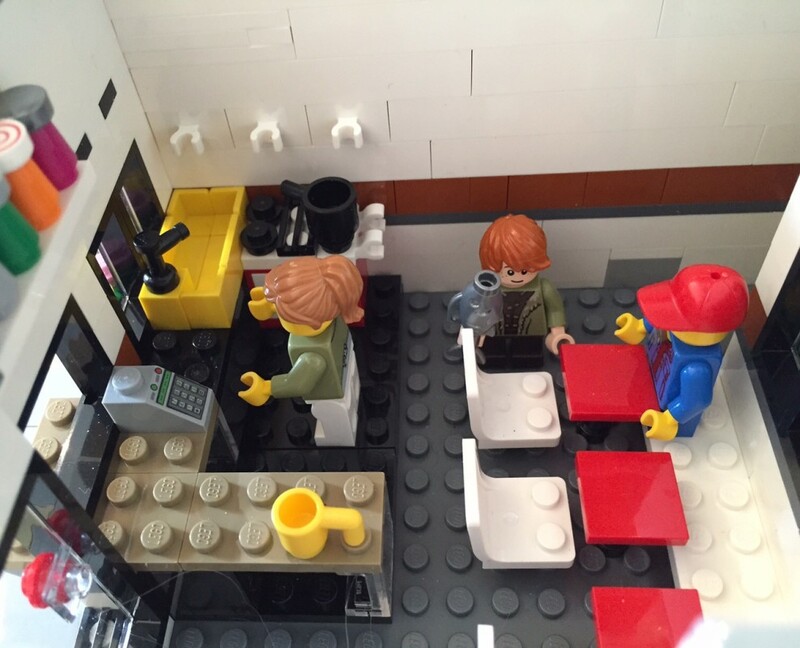 The front of the Deli MOC, which incorporates the sandwich sign from the Creator set. 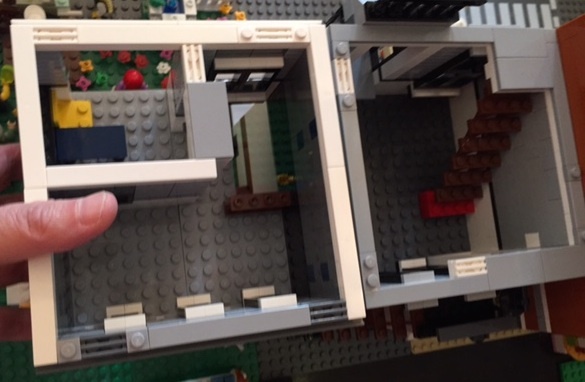 I had originally intended to build my first MOC (My Own Creation) on a half-size plate, 16 by 32 studs instead of the full-size 32 x 32. However, I got carried away with the interior of the Radio Station, so my debut project was a particularly ambitious one. 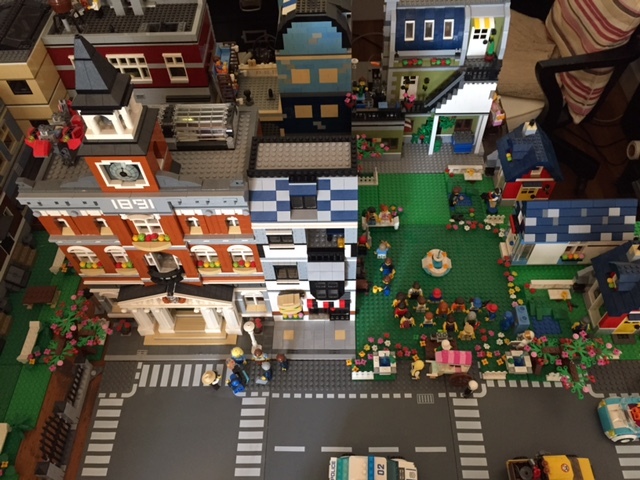 But if I wanted to place a building next to City Hall and keep the park, I only had room for the 16 x 32. So, quality instead of quantity. Little Brick Township doesn’t need another eatery — we already have the Corner Cafe, the Parisian Restaurant, and a variety of food carts. But eateries are also gathering places, which explains why in any town or city, bars and restaurants outnumber most other enterprises. 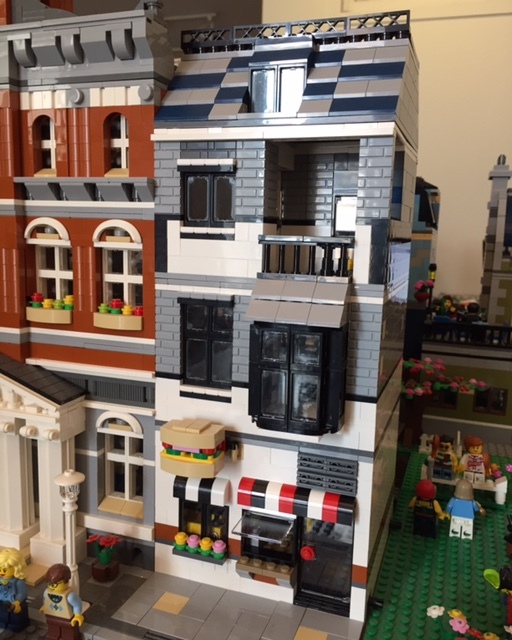 My design began with the Corner Deli released by LEGO earlier this year, but when I bought the set, I intended to mine it for pieces, particularly the decorative sandwich which I attached in a different way to my building, which has a solid front and like the other buildings in the Modular series, opens by lifting off each floor. The rear of the Deli MOC. Who is Ma Mumfield visiting? My interior used some of the pieces for the Corner Cafe, but most were pieces I’ve collected over the years from the Pick-a-Brick Wall at the LEGO Store. That’s where I’ve found my chairs and tables, doors, staircases, window details. 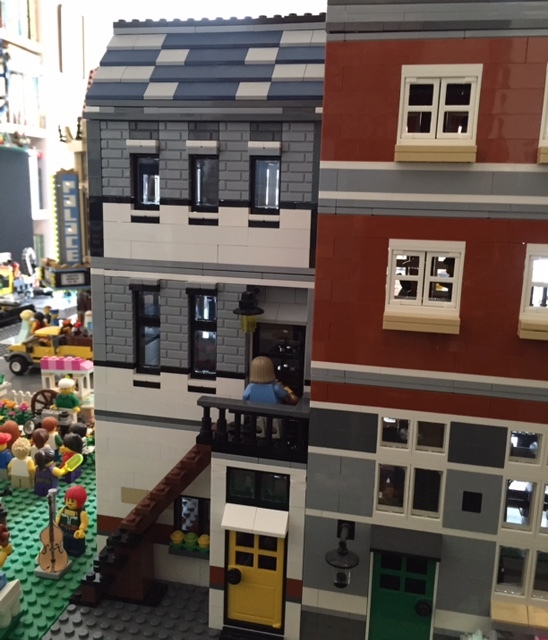 The matching 1 x n bricks have come mostly from last year’s bulk order made available to members of LEGO User Groups. Especially valuable for this building were the gray 1 x 2 profile bricks for the window columns. The navy sloped bricks for the roof came from the Creator Apple Tree House, a long out-of-production set that I found for a surprisingly reasonable price at a toy store in Vermont. 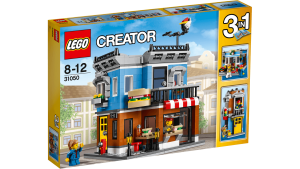 I agonized over cutting up this set, thereby destroying its collectible value, but I realize that LEGO bricks are meant to be used, not bought and sold as investments. I had to move the park 16 studs over to accommodate the new building. 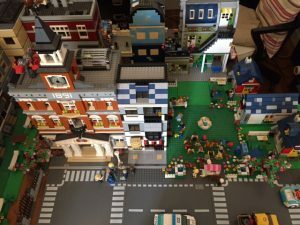 My town is running out of room to expand, and eventually I’ll have to make hard choices — bring another table into my New York City apartment, or sell some of my MOCs. I’m building some Tiny House MOCs, inspired by the HGTV show Tiny House Hunters, one of which I plan to donate to the VCFA auction this summer and others that I’ll put up for sale. And then, with the money, I can…buy more LEGO! The interior of the deli. Smoked fish is the daily special. The duplex apartment upstairs still needs furniture.